Looking for the best tourist spot in the Philippines? The region of Metropolitan Manila comprises the cities of Manila, Quezon, Pasay and Caloocan. Actually while Manila looks huge and sprawling, Davao City is actually three times the size of the national capital. The city of Cebu is the oldest city in the Philippines. Where are your favorite Philippine Tourist Spots? There cheap flights to Philippines, so what are you waiting for? The region of Metropolitan Manila comprises the cities of Manila, Quezon, Pasay and Caloocan. Actually while Manila looks huge and sprawling, Davao City is actually three times the size of the national capital. The city of Cebu is the oldest city in the Philippines. Where are your favorite Philippine Tourist Spots? There cheap flights to Philippines, so what are you waiting for? The Philippines is a very volcanic country and it’s a great for some different hiking adventures in fact there are some 22 volcanos in the Philippines. The highest mountain in the Philippines is Mt. Apo, and this is actually a dormant volcano on the island of Mindanao. Its summit is some 2,954 meters (9,689 feet). Mt. Pulog in the island of Luzon is the second highest mountain with a summit at 2,928 meters (9604 feet). There are some really beautiful places in the Philippine. If you are near the mountains then check out the waterfalls in the Philippines, in fact you could just take a waterfall tour and visit them all. Where is Pagudpud some might ask? Pagudpud or Pagudpod as its now and again called is magnificent one day and perfect the next. Quite a lot of people call it the Boracay of the North, but we disagree and say it is Boracay as it formerly was! And that's why it's so popular. It is Boracay as it was 25 years ago! 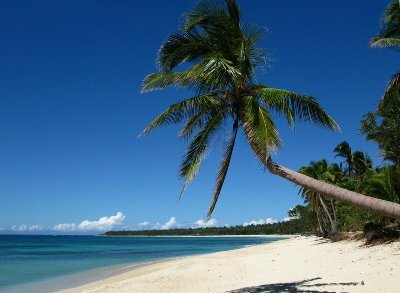 The clean white sands of Saud Beach are located at Pagudpud. The village is located to the north of Bangui and its now renowned windmills and inland lies the monumental Cordillera Mountain Range, the largest mountain range in the Philippines. To the North and the West are the inviting waters of the South China Sea. The secret is now out about pagudpud and now international tourists are coming and are greatly interested and one of Australia's most influential foreign travel writers rated Saud Beach as Number 1 on the list of the Top Ten best Asian Beaches. Nothing good stays secret forever so come find Pagudpud before the tourists find out. The local region comprises genuinely pretty and almost abandoned beaches, striking waterfalls, sensational picturesque vistas, and a real genuine get away from the rat race feeling. It is no wonder that so many movies and television commercials are filmed here. Close the eyes and picture a beach without too many tourists, no noisy jet skis, no seedy strip of bars and not even a McDonalds restaurant! Bliss! Pagudpud is located amidst lush green mountains, luxuriant valleys, rolling hills and flat coastal plains. The 20,000 inhabitants who stay in Pagudpud and the surrounding area subsist on rice agriculture, general farming, fishing, and the fresh fish and lobsters are delicious and not expensive here and more recently tourism is increasing. Because Pagudpud is so uncommercialized there are limited places to stay and you need to book well ahead. Click on this link to find out more about Ilocos Norte All About Ilocos Norte Vacations and all you need to know about Pagudpud and the best tourist spot in the Philippines.